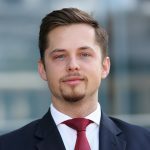 Founder and President of Lithuanian Business Association in Dubai (LBAD)) and Head of FinTech Sales at Bloomberg, UAE, Povilas Gudžius established LBAD with the mission to help Lithuanian firms uncover opportunities in the UAE market. Today this non-profit organisation connects 50 Lithuanian professionals/businesses and is a platform for bilateral economic trade between the countries. Povilas has been acting as a business and youth mentor at GLL programs – GLL Business Advisors and LT Big Brother creating exceptional working and learning opportunities in the UAE.